The FulCare Dental Plan is a great Alternative to traditional dental insurance. See how you and your family can receive a high level of dental care for an affordable price. Do you have anxieties about visiting the dentist? 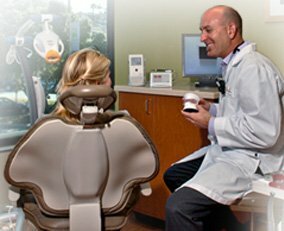 Sedation dentistry can help you remain calm and relaxed throughout any treatment. Dr. Fulbright offers oral conscious sedation techniques designed to give you a relaxing, painless experience. Welcome to Fulbright Cosmetic & Reconstructive Dentistry. The team at our Redondo Beach practice is committed to providing every individual who walks through our doors with exceptional dental care and customized treatment. With the comprehensive range of procedures available at our office, we can help you improve the health of your teeth and gums and completely renew your smile. We understand that every individual is unique; therefore, no two procedures can be exactly the same. That’s why our treatments are personalized based on your individual needs and goals to produce the best results possible. Cosmetic dentist Michael Fulbright, DDS and his skilled team of dental professionals are committed to offering our patients the latest treatment techniques in a calming, relaxing environment. Your comfort is one of our top priorities, and we will do everything in our power to ensure your visit with us is as pleasant and convenient as possible. We truly believe that a healthy, beautiful smile can ultimately have a positive effect on one’s overall appearance, in addition to their self-esteem. We are dedicated to helping you meet your needs with results that exceed your expectations. Please feel free to browse through our website for a detailed look at our practice and the many services we offer. If you would like more information, or if you would like to schedule an appointment here at Fulbright Cosmetic & Reconstructive Dentistry, don’t hesitate to contact us today! Our experienced cosmetic dentist, Dr. Michael Fulbright, has received extensive training in a variety of cosmetic dentistry, reconstructive dentistry, and implant dentistry procedures. We offer a comprehensive range of treatments to help you improve both the form and function of your teeth. Our dentists are committed to providing you with healthy teeth and gums and a beautiful smile!